The community will gain incinerator air pollution to add to truly massive NAMA-Poolbeg debts, IGB unemployment and deliberate institutional environmental vandalism and eyesore architectural conditioning. 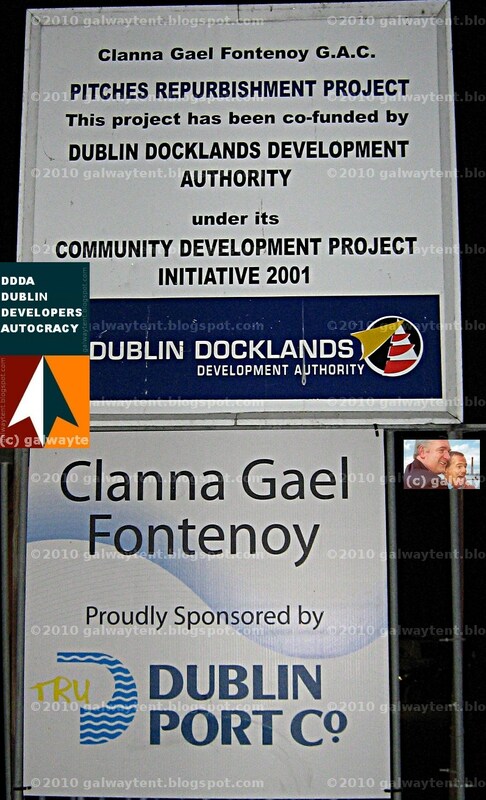 Clanna Gael is an excellent GAA club located directly beside the IGB Glass Bottle site in Ringsend. The club provides genuine benefits to the local community. Unfortunately the Galway Tent exploits the club - propaganda plaques and signs from the cabal directly responsible for the €500 million IGB mess are everywhere. Down the road the King's Shilling of Community Gain is also being hoored-up by the incinerator proposers. Cynical local politicians smell votes. Meanwhile parasitic speculators all across Poolbeg are being rescued by NAMA, for the little people's benefit of course. Bertie formally opened a new club house for Clanna Gael a few years ago. The plaque says so. So did the photo-ops. 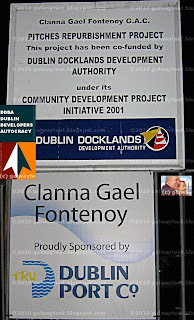 In honour of Bertie's usage of the language, DDDA erected large signs proclaiming the repurbishment [sic] of the pitches and then went on with others to dump €500 million of the people's money into a hole in the ground directly over the GAA club's fence. Invisible pollution in this area already exceeds safe levels. Dublin Council's planned incinerator will increase air pollution at the GAA pitches - causing problems a few years or even decades later for the footballers and the hurlers. 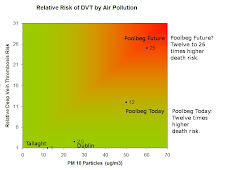 The most deadly pollution particles (PM0.1) are not monitored by EPA; the law does not force this measurement. Actual Community Gain: Twelve-Times Death Risk. Is it good to play vigorous sports at Clanna Gael? The entrance to Clanna Gael is on Sean Moore Road. 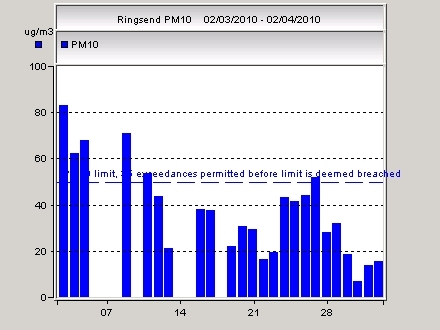 Instruments near Sean Moore Road recorded dangerously high air pollution levels in March 2010, and have been doing so for a long time. 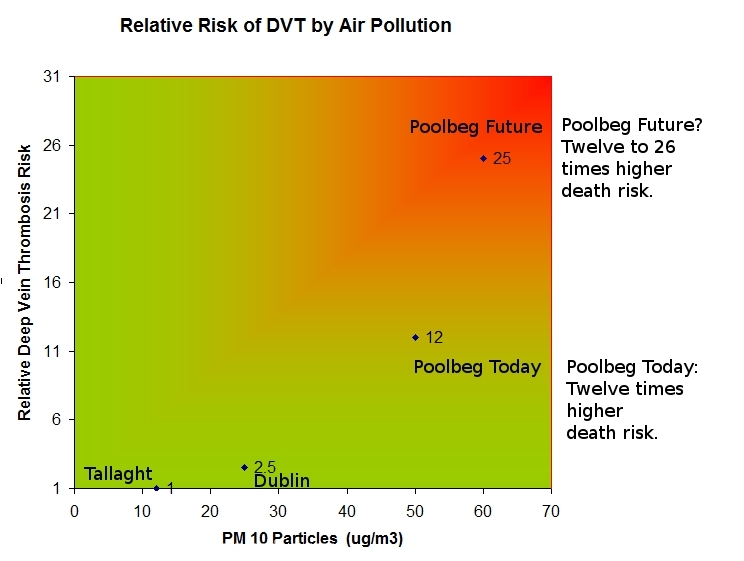 Compared to Tallaght it's twelve times more likely anyone breathing this air will have a heart attack or stroke, at some unknowable time in the future. Alzheimers risk also increases. The micro and nano particles from the air enter the bloodstream and travel to the brain where they may enter brain cells. One particle could be enough. Nobody knows. EPA's simple instruments only weigh the less dangerous micro-particles; they do not count the number of very dangerous nano-particles. Any observable damage occurs years later. Nano-particles come from 'green' diesel cars and from incinerators. 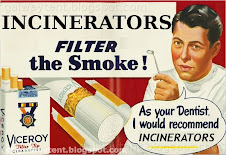 An incinerator will increase the pollution and thus the health risks. Removing diesel vehicles from the streets is not practical for the city. But an incinerator is an unnecessary choice. So why did Dublin Council choose this polluted location for its proposed incinerator? Did they consult the old financial regulator? Or was the philistine scheme ordered from the galway tent? Buyer of IGB Site: DDDA Autocracy, and friends. Seller of IGB Site/Lease: Dublin Port Company. Private Companies benefiting: Ardagh Glass, South Wharf. Financier: Anglo-Irish Bank & AIB. Planning Permission: DDDA Planning Repurbishment Projects Division of Anglo Irish Bank. Once upon a time in November 6, 1998 The Phoenix reported Mr Paul Coulson's Irish Glass Bottle factory was under threat from a massive new glass factory opened by Mr Sean Quinn in Fermanagh. Solution found: In 2010 the factory became a fine €500 million NAMA asset. After 1998 many cute wee hoors became involved with Anglo Irish Bank and DDDA. Manic property speculation was practiced by insiders with inside knowledge and by others. Then the Irish national bankruptcy happened. In 2009 Australia's government used the IGB fiasco to lure skilled workers to the penal colony. Near 2010's April Fools Day the new financial regulator put Mr Quinn's insurance company into administration (similar to 'Chapter 11') as it seemed the insurance company's reserves were moving into Anglo territory. In 2008 Mr Quinn personally lost at least one billion Euro trying to save Anglo in a then secret deal involving ten special people. In the past, billions were parked in Anglo by PTSB to repurbish Anglo's books. 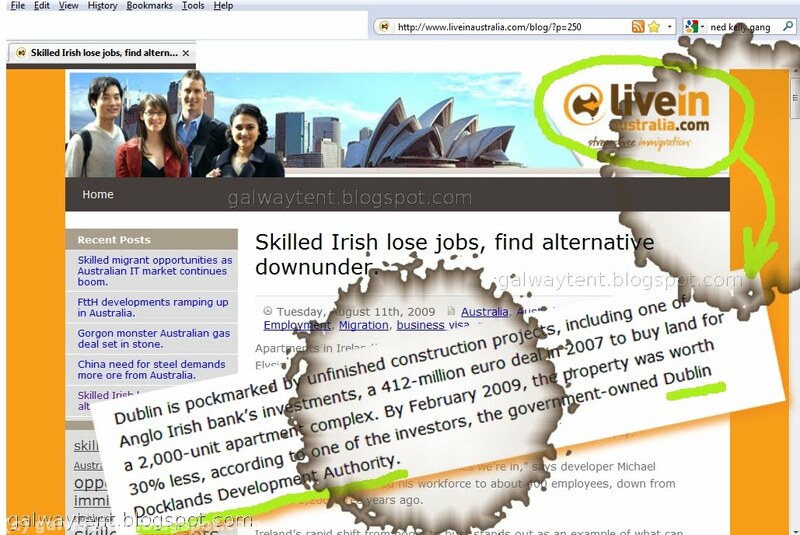 Now in 2010 Anglo claims Quinn Insurance owes Anglo €3 billion and Anglo may buy Quinn insurance to save it. One bankrupt saving another bankrupt? This could be an April Fools Day joke or a farce or reality. How would any outsider know? Based on past information-withholding, Anglo's accounts can certainly not be trusted. Bertie's buddy was appointed by Bertie to be boss of Dublin Port Company. Was this before the IGB site or its lease was traded to DDDA and the Becbay speculators. IGB provided the Cooler, trading as Ardagh Glass a share of a few hundred million before he moved to Lausanne. Finance Minister Cowen correctly signed the necessary paperwork for DDDAs investment. Dublin Port Company gained about €100 million for its pension fund. Dublin Port Company is owned by the state of the Republic of Ireland. 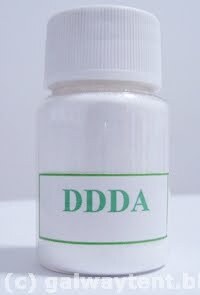 DDDA is also owned by the state. Legally the Port Company is supposed to restrict its work to Port Activities only. That would be ships and containers and jobs for dockers. The Port Company is allowing land contiguous with Dublin Bay's special area of nature protection to be used for incinerator construction, without environmental due diligence. The faceless men and women have already destroyed an established nature habitat for protected wildlife. Cutting off the fresh water supply for Brent Geese is payback. After all the Brent Geese have been repurbishing guano all over DDDA's repurbished pitches. Repurbishment: 1. The massaging of reports with the goal of obtaining a predetermined result; 2.the exercise of undue influence in public consultation circuses supposed to be conducted in the public interest; 3. shijting on the public; 4. shijting on the DDDA. Poolbeg Housing For Votes Scheme Being Managed. Irish People Skinned Again at IGB.